This superbly illustrated book is truly inspiring. It teaches kids aged 3-8 that Jesus has promised to bring them peace, help, care, forgiveness and so many other rewards and blessings when they follow him in practical ways. 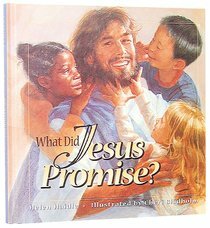 About "What Did Jesus Promise?" Jesus made many promises. And He always did what He said He would do. Jesus loves you so much. He dies on a cross for your sins -- and then he came alive again! He also made many promises to you and me -- promises to bless you when you make peace, to forgive you when you forgive others, to give you peace during times of trouble, to take care of you, and to answer your prayers. Jesus promised to reward you for your giving even when you give a glass of water to a small child. Look forward to the home Jesus promised to prepare for you, and to His coming again as King of kings. Get to know Jesus' promises. You can be sure He will keep them. Best of all, He promised to be with you always because he loves you. As families prepare for the uncertainties of the new millennium, this is a unique book to help children live in faith centered on Jesus and His promises. Simple, straightforward text on each double-page spread introduces a Scripture promise from Jesus with an encouraging theme for children. Wisdom For Young Hearts: What Did Jesus Promise?